Croeso and welcome to the Story of All Saints Church, Oystermouth in the heart of Mumbles, Swansea. This ancient and modern Church, writes Canon Keith Evans, Vicar of Oystermouth, has been a place of Christian worship for well over a thousand years. It is quite likely that there was a Christian presence here sometime towards the end of the Roman occupation of Britain. The Church itself is built on the site of a Roman settlement. This could have been a villa, or more likely a mansio [inn] or even a military / naval base. In the 1690s Isaac Hamon noted that the Churchyard was 'paved with small discs of divers colours as red, white, yellow. The people call it the Saints Pavement.' Part of the Roman or Saints Pavement is now preserved in the west corner of the south aisle. Like many other ancient Gower Churches, All Saints probably began its life as a Celtic llan [hermitage]. There is some evidence to suggest a link with the celebrated 6th century abbot St. Illtyd [of Llantwit Major fame]. A Welsh monk, Nennius, writing in the early 8th century, records a legend involving Illtyd in Gower - including an early version of the Welsh name for Oystermouth - Ystumllwynarth. During the early centuries the dedication of the Church might well have been to St. Illtyd. The earliest recorded references to the Church date from 1141 when the Norman Lord, Maurice de Londres, granted the Parish of 'Ostremuwe' to the Benedictine Priory of Ewenny. 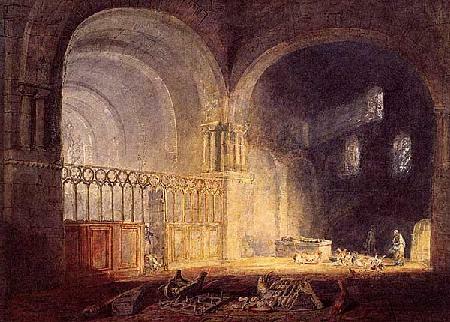 A painting byTurner in 1795 of the south transept of the Priory Church, Ewenny which was built between 1115-1120. In 1367 Oystermouth lost its connection with Ewenny and became linked with the hospital of St David in Swansea - now the Cross Keys Inn. During the dissolution of the monasteries, the Parish came into the possession of Sir George Herbert of Plas House, Swansea, and remained in private patronage until the disestablishment of the Welsh Church in 1920. The Reformation and the following centuries were turbulent times for this and other parishes in Wales. During the 17th and 18th centuries All Saints was at times neglected, notoriously poor and was served by a succession of perpetual curates rather than vicars. Image above dated c.1790. In the 19th century the fortunes of the parish changed. 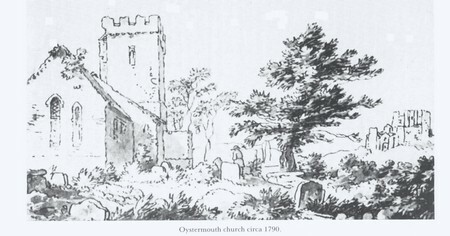 As the village of Oystermouth grew to become a trading and tourist centre so the Church grew. In 1860 the north wall of the medieval Church was pulled down and replaced with the present arcade of five bays and a side aisle was built. In 1873 gas-light was installed as well as the first organ. In 1915 the Victorian extension was itself demolished to make way for the present nave and chancel. The work was completed by 1937. The photo below shows the Bishop of St. David's, the Rt Rev'd Dr. John Owen, at the stone-laying ceremony 1915. It was a lovely summer's day and the procession to the Church was headed by a siver band while everyone sang 'The Church's One Foundation.' The foundation stone lies at the corner of the present Choir Vestry. During the 20th century many gifts were presented to the Church, among them, the magnificent Rood Screen, the Reredos, East Window and the Lifeboat Memorial Window. For very many years All Saints housed three bells from the fire-ruined Jesuit Cathedral in Santiago. These bells have now been repatriated to Chile as a gesture of friendship and goodwill for the new memorial in Santiago to the 2000+ people who perished in the conflagration. You can read all about the bells here - Bells of Santiago. Our Parish Church stands as a remider of the faith of earlier generations and is also home to a lively and growing Christian community today. God's Word is read and proclaimed and the Christian Sacraments are celebrated. Through its history All Saints Church has been served by a succession of faithful priests and people. It has also nurtured a vocation to the ordained ministry in those who have gone on to serve elsewhere. The most famous 'son of the parish' is previous Archbishop of Canterbury, Dr. Rowan Williams (Lord Oystermouth) who was confirmed here, served as a chorister and altar boy. Bless, O Lord our God, the worship and work of this ancient Church, that it may be a house of prayer, a centre of Christian teaching, a community of service and a witness to your reconciling and redeeming love: through Jesus Christ our Lord. Amen.